A Brooklyn Center fire will force a family of five to find another place to live after a fire destroyed their townhome. Flames broke out in the 7200 block of Unity Avenue around 10:30 p.m. Wednesday. The Brooklyn Center Fire Department is trying to determine a cause. Erica McWilliams was visibly shaken as she surveyed the damage to her rental townhome. “We don’t have nothing right now, it’s kind of like a disaster,” she said. Melted plastic siding and charred pieces of wood are all that’s left of Erica’s home. The family had just finished saying their bedtime prayers when the fire started in the daughter’s bedroom on the second floor. The mom scrambled to get three of her children out of the burning home. 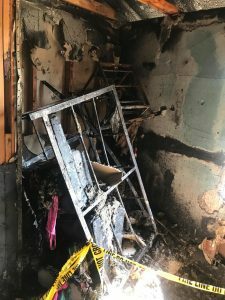 A fourth child was not at home at the time of the fire. Once the family got out of the burning home, reality set in. The family left with just the clothes on their backs. “My kids don’t even have shoes to wear right now, “McWilliams said. During our interview, two of the boys wandered around barefoot. This fire is even more traumatic, because McWilliams is recently divorced and is just starting over. She says although the family lost their belongings, she says in a lot of ways they are lucky. “I’m just grateful that they are still alive,” she said.